A bit from next week’s Hill Times column. Comments are open. Donald Trump won. He beat us all. He has dominated the politics of this era like no other, standing bestride it like a Cheeto-coloured colossus. As I type this, there are 24 news stories on the main page of CNN’s web site. Fourteen of them are about Trump. 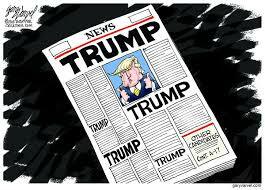 The New York Times and the Washington Post’s front pages have six news stories each – and in the Times, three are about Trump. The Post, five of the six. In Britain’s The Times, just two stories – one about their World Cup loss, naturally, but the other is about Trump, coming to have tea with the Queen. In Germany, the verdict in a homicidal neo-Nazi’s trial is ubiquitous – and then there is Donald Trump coverage, above or near every fold. And so on. …At this point, in this year in this Century, winning is simply defined as sheer dominance. Winning is not just securing power – it is wielding power in such a way that no one else can be heard anymore. And that is why Donald Trump is the winner: he does not merely dominate the news cycle. He is the news cycle. yes but it is generally bad news coverage, undermining the office, key international institutions and US economic interests globally. Plus he is good for business. The NYT, the Post and CNN have all seen there ratings and profits soar since they abandoned disinterested journalism and joined the Resistance. As Trump’s approval ratings show, they’re not winning many converts, but they are giving daily fixes to Dems and progressives who hated him from the get-go. After his election, there was a brief flurry of thoughtful articles from liberals and leftists who said that progressive America was going to have to step back, look in the mirror and have a tough debate on how they came to lose so much of the demographic they always believed they stood for. It didn’t last long. It’s proven to be easier and much more fun for them to rend their garments on a daily basis and scream about yet another outrage and the threat he poses to civilization as we know it. Extra points for Hitler analogies. They are letting him define their agenda by simply standing unthinkingly for the opposite of whatever he says or does. (The reaction to the Korea summit was absurd). And they are lionizing such losers as Robert DeNiro, Kathy Griffin and Stormy Daniels. Do they think middle America finds these characters inspiring? Conor Lamb won a seat Trump took handily by taking the constituents seriously, talking about issues and not treating the voters as if they were various flavours of deplorable for supporting Trump. Given Trump’s numerous flaws and cringe-worthy character, it should be a cakewalk for the Dems in 2020, and it might be if they follow Lamb’s example. But after two years, I see no sign they are going to do that. It looks like they’re going to run on Trump Derangement Syndrome and I wouldn’t bet a dime on their chances. Without a centrist democrat as the party nominee in 2020, they lose, period. Woe is me soul-searching will also be critical for Democrats on where they went wrong but message ain’t what really killed Clinton in the Trump electoral college states. This is all about GOTV and Democrats lose, when they turn out in numbers like last time. It’s not about how DEMS voted in California or New York — they lost cause progressives failed to turn out in significant enough numbers to win in critical states. CNN ratings soar? No. CNN has lost between 20-35% viewership in all demographics since November 2016 according to Nielsen and AdWeek. When Trump talks about their ratings, he’s actually correct. CNN’s daily viewership is along the lines of *Nickelodeon*. Yes, Sebastian Gorka points this out frequently but he’s not incorrect. FNC has seen their viewership bump up about 9%. I agree with Ronald, but with one critical difference which is this; all the Dems have to do is not be insane, and they can’t do it. This fall they’re going to try to introduce a bill to abolish ICE (according to what I’ve read today). Absolutely insane. Agreed to this extent: the Democrats unfortunately are not good at nuance. They forget that ICE is far from being only about immigration enforcement. Their mandate covers so many areas. This debate should be about reform – – especially about the 100-mile border enforcement zone, not about abolition. Optics is everything here and the Dems are seemingly clueless that you don’t use a butcher knife to make a one-inch incision… Pathetic. They are likely just killing themselves in the voting booths. Is it true that all publicity is good publicity? Trump does appear to hold a lot of real-estate in people’s minds. Free-media without being torn down, punching back, it’s a logical extension of The War Room Chapter 3. Quick experiment: use Google Trends and compare the keyword Obama in pre-election 2012 and then post-election 2013. Huge drop from 46 to 8. Then look at Trump in 2016, 2017, ’18 he continues to be searched at a high volume (relative to other queries). Counter-factuals are Instructive, As well: Niall Ferguson popularize this idea where you imagine, for example, Hilary Clinton won the 2016 election. I would say that most people would be able to TUNE OUT of US politics (a.la Obama in ’13-’17) because the US would have been managed with stability, without disruption or shaking the black box, no rattled cages. If only! think of how much brain space would have been opened up to solve real problems! It doesn’t matter if it’s bad news, good news, the truth or fake. Or whether it hurts the country, institutions or anybody else. It’s all about the number of eyeballs, clicks, visits, referrals, retweets that this type of narcissism needs. Warren knows about this stuff. It was part of what War Rooms used to do. Unfortunately with this type of narcissism the War Room is forgotten. It is only about self importance. Yup. Adams has been prescient on this. Cheeto-head-in-Cheese dominates the news cycle because the entire USA is known worldwide as a defunct ex-‘superpower’ that has fallen from economic & political grace. Since the Great Financial Crisis started in 08 the USA debt-Ponzi has imploded on a global scale. Trade deals have to be re-written in order to prop the USA bureaucratic system & Deep State up given their overarching leverage from Quantitative Easing. Now that the debt-Ponzi is coming home to roost on the flip side of Quantitative Tightening we will evidence mass hyperinflation from housing to commodities all over the USA and the BIG Cheese will take the credit. Orange Jesus Cheeto-head-in-Cheese is merely P.T. Barnum II and a second rate carnival barker with no bite and only bark. Furthermore, poodles typically run defence by being yappy, annoying, and persistently single minded in approach not unlike a narcissist Psychopath like The Duck. Wow, that’s deep. I particularly admire your dispassionate and measured analytical skills. You’ve certainly convinced me we will be well rid of these decrepit poseurs and that it’s time to pass the hegemonic torch to a healthier, rising power. Got any good candidates in mind? It’s tough, I know, because there are just so many appealing candidates out there. The New World Disorder does not require a new hegemon, but if you follow the trend it would automatically be the largest competitor to the defunct USA Federal Reserve Fractional Banking System which is empirically China by market default. And always remember that the trend is your friend in Trading. My portfolio is up over 50% since Trump got elected. How can you not like that? Let the whiners whine. Who cares about the rest of you? You never did anything for me anyway. I’m retiring early, thanks to Trump! 6 more years! Golly, it would be terrible if you dropped dead just before you retired. That would be really SAD. Why would anyone care about your ‘portfolio’, Capitalist? And those with actual investment portfolios don’t announce their successes or failures on investment, poser. People said the same thing in 1999, and 2007 (and 1986). So just for clarity, if the market drops, then it’s Trump’s fault, right? Or do you only credit the good and ignore the bad? In addition, are you saying that Obama was a good president because the market was higher when he left office than when he started? The stock market was still reeling from the effects of a world-wide recession caused by the US sub-prime mortgage collapse (thank you, Bill Clinton) when Obama entered office, so it really had nowhere to go but up. That said, Obama’s people made a point of not taking credit for market growth because they knew that they would also have to take the blame for any slowdowns, and the US stock market is not the same thing as the US economy. Damn! I thought we had a shot at it with Gropegate. This is why my boycott of American is as much American items as I can manage, not focused on red/blue state or mindset. The left-wing media is feeding, Trump, his supporters and division. It is not political issues that disgust me about Americans, it is the moral and ethical choices they are making now. There is no law that says everything the President says and does must be reported. In fact, there is a longstanding tradition of not doing so. FDR’s wheelchair use was minimized, JFK’s not shown at all. JFK’s infidelities were not daily front page news. I’m sure there are many other examples, those are the ones that pop into mind. There is no reason why the press and media cannot report the issue the president is raising, instead of the behaviour of Trump. Let’s separate the office of the President from the madman. He loves to see his name in print. Deny him that. He loves to be quoted. Deny him that. He loves to be the centre of attention. Deny him that by putting the issue at the centre. You are a clever one. No! I insist on remaining in blind denial about his self-proclaimed victories and increasing attraction from moderate baby boomers who are allegedly seeing their 401ks increase. It’s just easier this way. I’d like to know what is the competition they are in? Far be it from me to dare suggest that the NATO genius could be wrong. In his first book, Trump talks about the demolition of the art deco friezes from the Bonwit Teller building, which he demolished to build Trump Tower. Trump at first agreed to preserve the friezes, but he found they were delaying demolition, and cost too much to preserve. So he had them cut up and destroyed. Trump had an avalanche negative publicity for this, including being denounced on the front page of the NYT. The coverage was brutally negative, but every story described what had happened by saying Trump destroyed these priceless friezes “to construct the world’s most luxurious building”. The lesson he took from this was that no matter how negative the coverage, you still benefitted if the coverage included your major marketing message. And when Trump makes his outrageous statements, and then doubles down, every story is repeating his messaging. Didn’t Louise Sunshine have something or other on her balcony?